In 1982, a group of Tallahassee’s civic leaders came together to create a quality, affordable health care system to meet the health needs of the community. More than thirty-five years later, Capital Health Plan has become a national health care leader. We started with 5,000 members and a network of 75 doctors. We’ve now grown to more than 135,000 members with a broad network of more doctors, hospitals and other health care providers throughout our service area. A key component of CHP’s delivery system is its employed medical staff, who practice in two state-of-the-art health centers CHP has developed to serve its membership. These health centers are equipped with electronic medical records and can accommodate a broad range of preventive, primary, and specialty care services including evening and weekend urgent care, lab, x-ray and digital mammography, colon screening, an eye care service, wound care, and a center focused on the needs of chronically ill members. CHP’s ability to offer this highly organized component of its delivery system provides unique opportunities for adding value. The staff model of CHP’s delivery system is the engine of our program, consistently driving better results on measures of clinical care, member satisfaction, and affordability. Is proactive and innovative in its quest to continually improve the health of the community. For more than thirty-five years, Capital Health Plan has provided comprehensive and affordable health care to our members in the Tallahassee area. 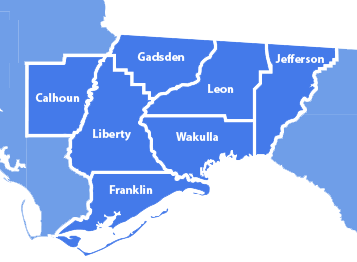 We proudly serve Calhoun, Franklin, Gadsden, Jefferson, Leon, Liberty, and Wakulla counties in Florida. Capital Health Plan offers our members something unique — exclusive acess to two high-quality health centers. CHP Health Centers offer a broad range of preventive, primary, and speciality care services including evening and weekend urgent care, lab services, x-ray digital mammography, colon screening, eye care services, wound care, and a center focused on the needs of chronically ill members. At Capital Health Plan, we strive to help everyone in our community maintain an active, healthy lifestyle. That’s why we support community events, programs for local schools, and much more. See what local events are coming here. Capital Health Plan is the highest-rated plan in Florida and among the highest-rated plans in the nation, according to NCQA's Health Insurance Plan 2017-2018 Ratings. Read more about our plans and their ratings. Review Capital Health Plan's Financial Statements. Download our Financial Statement from December 31, 2017 and 2016. Download our Financial Statement from December 31, 2016 and 2015. Download our Financial Statement from December 31, 2015 and 2014. You may access our Notice of Privacy Practices at anytime. You may access our Privacy Notice at anytime. You may access our Identity Theft Prevention Policy at anytime. You may download the Member Rights and Responsibilities at anytime.